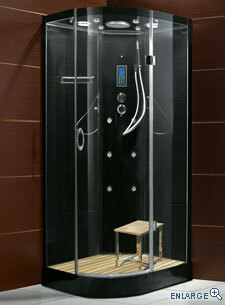 Steam showers enclosures are good for your health. The hot steamy environment causes the core body temperature to increase, causing the user to sweat. The body happens to use sweating as a way of both cooling itself and ridding itself of toxins that are harmful. As a result, when we sweat in a steam shower, the body will push some of these toxins, which were sitting just under the skin, out of the body through the sweat and oil glands. The Finn’s have a saying, ‘You look your best 2 hours after a sauna‘. The same principle applies to steam showers. When you are relaxing in the steam, tiny capillaries which are at the surface of the skin are filled with blood. This is in an attempt to eject heat out of the body, however the process has great benefits to the quality, look and complexion of the skin. Along with the heat, the blood carries nutrients and oxygen which are life giving miracles to the skin, which make the skin look healthier, more vibrant and simply makes you look better. Steam room benefits are many and varied. Try it, you’ll see real results. When stressed out, a lot of people find the best solution is to just get away from everything and relax, to clear their mind. The steam shower not only causes great relaxation through the warmth which heats up the muscles of the body, it’s also a place where you can escape and be by yourself. A perfect place to unwind and think. Steam Showers also add desirability to your home. If you’re ever wanting to sell your home, owning a steam shower will certainly add desirability and value. A steam shower shouldn’t be seen as a luxury but rather an investment into your home. In the meantime you’ll be the envy of all your friends! So there you have it; 4 fantastic reasons why you should buy a steam shower.